I read an interesting article on Guardian critiquing novelist Rolf Dobelli’s ideas that reading news can be dangerous for you. The kind of “breaking,” “live,” news that characterizes much of our experience these days is not very helpful and at worst, actually can be harmful to your well-being His argument is that real insight and understanding is never instant. “ It takes time to piece together complex causality, and the global news machine of bite-sized nuggets doesn’t do complexity,” he adds. In this day and age of global violence, financial crisis, natural disasters; even the smallest incident can (usually) be blown out of proportion and become part of our consciousness like never before. Firstly, that news media misleads. Often confusing correlation with causation. Pick any big issue, and chances are that many journalists are making this mistake. He says:” Take the following event (borrowed from Nassim Taleb). A car drives over a bridge, and the bridge collapses. What does the news media focus on? The car. The person in the car. Where he came from. Where he planned to go. How he experienced the crash (if he survived). But that is all irrelevant. What’s relevant? The structural stability of the bridge. That’s the underlying risk that has been lurking, and could lurk in other bridges. But the car is flashy, it’s dramatic, it’s a person (non-abstract), and it’s news that’s cheap to produce. News leads us to walk around with the completely wrong risk map in our heads. 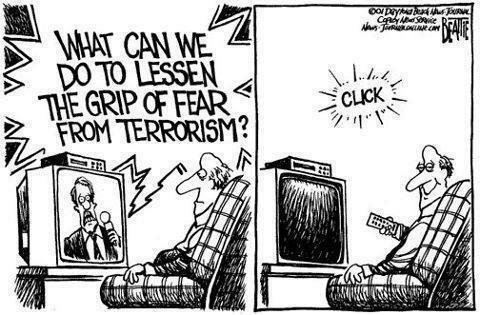 So terrorism is over-rated. Chronic stress is under-rated. The collapse of Lehman Brothers is overrated. Fiscal irresponsibility is under-rated. Astronauts are over-rated. Nurses are under-rated.” This is a compelling argument and one that one sees occurring, all the time. Media exaggerates: Just to put this argument in context, here is an interview with a Terrorism expert, David Schanzer, from Duke University. Here is the article about the recent Boston Marathon bombings and his reaction: “ Q: What is the trend today? Is terrorism being used less now than it was a few years ago, or are we just not hearing so much about it? David Schanzer: The decade since 9/11 has seen less terrorism (of all ideologies) than other recent decades. There were 168 attacks in the ten years after 9/11, but in the 1970s, there were 1357 attacks.” But given the massive coverage that these events receive these days, one is inclined to believe that violence related to terrorist attacks is on the RISE, whereas it is not so. Media is part of the mass consumption ethic: If one were to critique media, perhaps the most honest critique comes not from the capitalist or libertarian framework; but the Marxist framework. Here is Theodore Adorno, pointing this out in Minima Moralia. He says:” To speak immediately of what is immediate, is to behave no differently from that novelist, who adorns their marionettes with the imitations of the passions of the yesteryear like cheap jewelry, and who sets persons in motion, who are nothing other than inventory-pieces of machinery, as if they could still act as subjects, and as if something really depended on their actions. The gaze at life has passed over into ideology, which conceals the fact that it no longer exists.” This observation points to an ethic, where reality is manufactured, produced and sold, with happy consumers sitting by and waiting for their problems to be produced, analyzed and often solved – all in “real time” TV. This is the ethic that makes slacktivism possible, and also one where often “analysis,” and even “thinking,” is outsourced to the “experts,” because it is more efficient and easy to do. The problem of spreading ignorance and rumor: This is all too evident at the outbreak of every “major” disaster. Be it a hurricane, fire or a “terrorist” attack, rumors are aplenty immediately following the disaster. While more than 90% of the material just following most incidents is chaff and useless, this is precisely what captures the imagination of most of us. It is this voyeuristic, dark side of our personalities that media aims to feed, with the constant, live updates and rumor mongering and (often) half-assed assessments by “experts.” While those who understand communications and crisis management know that this is where “framing” of events is occurring, and it is where “truth” is defined, often the media outlets behave with callousness. So, am I advocating a return to the stone-age? No twitter, Facebook, live CNN coverage? The short answer is no, while the longer answer is ‘may be.’ While media has become a part of our consciousness and is critical in shaping our understanding of who we are, I believe it is in some ways even impeding our thinking, unless we are able to carefully discern the wheat from the chaff. As a regular user of media outlets (print, online and social) and having been a news junkie for most of my formative years, I realize the value of careful, thoughtful analysis and also somewhat skeptical of instant news or reports that claim to explain the world in 10 minutes. As researchers, journalists need to be more careful, methodical and also aware of the issues they are reporting on. Barring a small fraction, I would hazard a guess and say that most do not know what they are talking about. As a parting thought, and further proof that journalistic knee-jerk reactions often do more harm than good, here is Bill Maher trying very hard to prove to an expert that his knowledge of Islam and history is far superior; since he gets to be on TV and is considered a “star”. This is nothing but polemics, hatred and bigotry, passing off as “analysis.” And nowadays, you don’t have to watch the right-wing media for this kind of shallow reactions, unfortunately ; this is becoming all too mainstream.